Fourteen-year-old Peak Marcello is nearly two-thirds of the way through his secret goal when he gets nabbed, hauled by police onto the top of his latest skyscraper, even before he’d had a chance to tag it. Before Peak knows it he’s been arrested, appeared in court before a judge, and he’s headed out of the country in his father’s custody, the father he hasn’t even heard from in the past seven years. The worst part of it is, Peak’s dad has an agenda—an agenda that Peak’s both excited about and scared of. Peak’s dad wants his son to be the youngest person to climb Mt. Everest. Peak doesn’t have any idea if he can make it, and there’s a deadline, Peak’s fifteenth birthday is coming up fast. 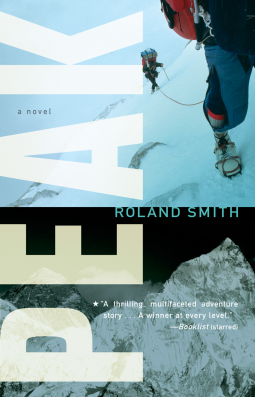 Peak is an engrossing adventure story. Peak Marcello is a kid to be admired. He’s strong, addicted to climbing (no surprise, since his parents were a legendary climbing team), and more than a little reckless. He’s also been put in a crazy position where he’s got to figure out how much he can handle, who he can trust, and whether or not he should cut and run. I loved this book for all kinds of reasons. I loved reading about cold Mount Everest on sweltering hot summer nights. I loved learning about the details of climbing Everest – you’ve got to go up and down bunches of time just to acclimate to the altitude. I loved accompanying Peak through his doubts and through his suspicions of everyone’s motivations. Were his feelings real? Were they affected by lack of oxygen or physical duress? Why does everyone want something from him? This book moves right along, and I think it will draw in all types of readers. Peak is a great pick for classroom and school libraries. The Edge, the sequel to Peak, will be out in October. I’ll be looking for it! I read Peak courtesy of Houghton Mifflin Harcourt Books for Young Readers and NetGalley.